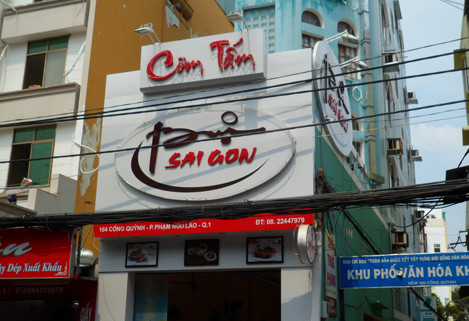 Everywhere I walk, the word COM is everywhere in Saigon. I see it on the food stalls and restaurants. Just outside of my hotel, there’s a non air conditioned restaurant bearing a big signboard with the word “COM” on it. I am smart enough to know that it’s not Internet related though. I decided to eat lunch there as my “FOODAR” told me that this restaurant will be all right. I was eager to find out the meaning of COM once and for all too. For those of you who are wondering what FOODAR means, is just a word I made up. It stands for “Good Food Radar”. Is not an I-Phone aps but is something I developed over the years hunting down the best eating joint. I sat down, the friendly waitress came and gave me the menu. The menu has pictures and it’s in Vietnamese and English language. Sweet! I browsed the menu for a bit and I see the word “COM TAM” a lot. You have the choice of COM TAM with chicken, beef or pork BBQ. 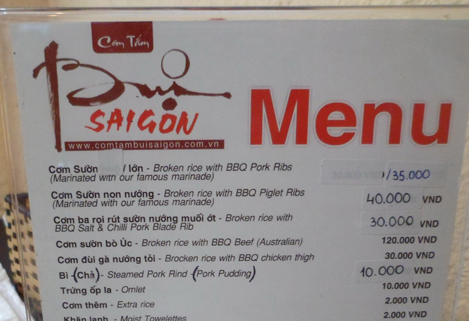 I noticed on the menu it has the translation for the word “COM TAM”. It is being described as Broken Rice. Sounds interesting! 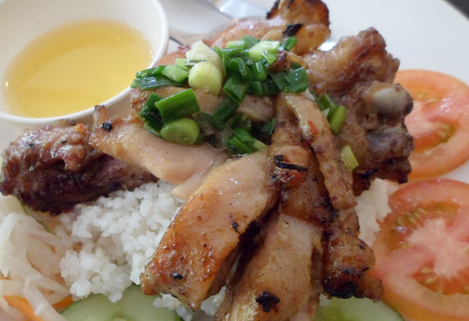 So I ordered Com Tam with chicken BBQ Vietnamese style. A few customers enjoying their Com Tam. 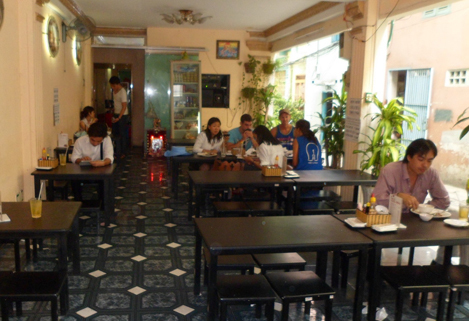 I love how Vietnam has all this low stools and tables. Just seem more relaxing and not so formal like normal size dining chairs and tables. 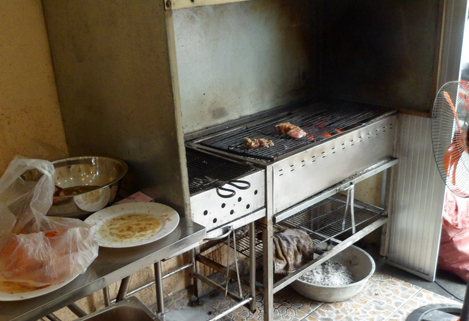 This is where your meat is being grilled. While waiting for my food to arrive, I went to get some pictures of the restaurant and glancing quickly at other customers orders. I love to see what they eat. After I am satisfied with my pictures taking, I went back to my seat and ordered a soup dish, saw someone having having the some what yummy looking soup. From my quick glance, I am guessing the soup would be beef tendon with tomatoes and pickled cabbage soup. Am really excited to see how the rice is being prepared. How often you get to eat broken rice? I then start to guess how the rice will look like, the texture and so on. I was pretty convinced that my rice would come in the form of paste or rice cakes. Just look at the lovely grilled chicken. After the meal, I read on wikipedia that the rice are broken during the process of cleaning. These broken rice are then separated from the good ones and sold at a lower price. 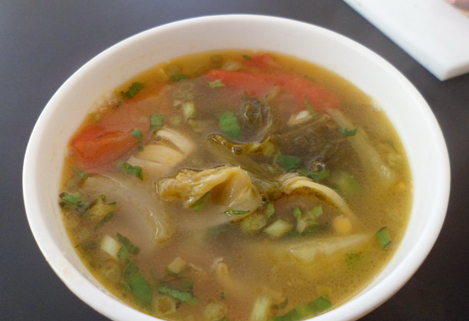 Initially Com Tam is food meant for poor people but some how it became favorite food of many people in Vietnam. When my Com Tam finally arrived, the rice look like normal rice to me. Nothing broken or beaten about it. Only when I start taking picture of my plate of Com Tam with chicken BBQ, I realized that every single grain of my rice is broken. This seems pretty odd as long grain rice fetch higher price as it always taste better. Along with my Com Tam, there’s a small bowl of dipping sauce that doesn’t look like the normal soya sauce or fish sauce that I am accustomed to. The color of the sauce looked like lemon juice but when I tasted it, it is no where near the taste of lemon juice. I just added finely chopped fresh chili into the sauce. Tasty beef tendon with tomatoes and picked cabbage soup. Perfect pairing as Com Tam does not have much gravy. I liked the taste of the chicken BBQ, which has a sweet taste to it. It goes really well with the sauce that I just added chili into it. Everybody will like this food at the first try. It is for sure comfort food for the Vietnamese I am guessing. The steamed broken rice was all right too. To my surprise, it didn’t lack the same texture as the expensive long grain rice like Basmathi or Jasmine. The soup came in a small bowl and tasted really good too. It has a little bit of beef tendon, the portion of the pickled cabbage was just right. I always take pictures of menu so I can remember the name of the food I’ve eaten. Not really meant to post it in my blog but I guess this particular picture is clear enough for you to check out the prices. Looks yummy…. must try their chicken and beef. I will try the beef for sure! I have been running a successful thai restaurant in toronto but never get into promotion online. I should be doing it for thai food lovers as it has been the best way to create brand online.